As our first full day in Chengdu comes to a close, I am tired, well-fed, and excited for yet another day of fun and exciting adventures. Too tired to remember to set an alarm the previous night, I woke up at 8:40 and knew at that very instant that I was terribly late since we were supposed to leave for the Chengdu Panda Base at 8:30. Rushing down and frantically hoping not to forget any important items, I made it to the lobby just in time to catch the bus. 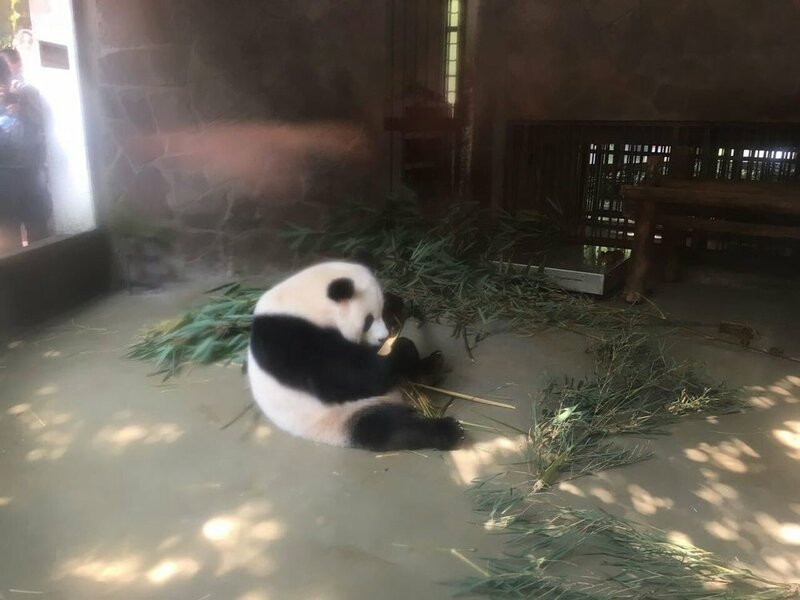 Once we successfully managed to herd the 44 of us through the entrance and into the actual Panda Exhibits, we were immediately struck by the scorching heat. After getting to witness a few pandas, my group ultimately succumbed to the combined pressure of both the overpopulation of the exhibit as well as the midday heat and ultimately chose to retire in a café aptly named “The Panda Café”. There, we feasted on delicious shaved ice desserts while relaxing in the air-conditioned environment. At noon, we once again herded ourselves to the designated meeting spot where, after taking some well-deserving pictures, we headed off back to our hotel. As my day progressed, I freshened up and headed down to the lobby only to find no JTC or Chinese Ambassador within sight. In hindsight, I am happy that I decided to wait for 10 minutes until some other lunchtime late-bloomers decided to show up in the lobby equally as surprised. We made the collective decision to head to the nearest mall where there was supposedly a food court. After heading up and down the escalators and asking the local mall workers where the food court was, we realized that all the food court was, was one restaurant. We needed to be back at the hotel in 40 minutes so we immediately ditched the idea of eating at the fancy sit-down and split our group apart. One part of group headed to a place called “food street”, which sounded awfully close to “street food”, setting me on edge. Not wanting to take the risk of eating street food, I made the decision to join the part of the team that wanted to go to McDonald’s and relish an old-time meal. At 2:15, Global Vision and FutureLink hosted a combined meeting in the Crowne Plaza Auditorium where we began with an interesting game of bingo that helped us get to know each other before breaking off into groups. We were given the task of presenting a potential marketing approach for FutureLink to attract more youth to their potential Mission to Canada. One of the ideas that we thought mirrored what Global Vision has done in Canada and hosting events like Round Tables and the National Youth Ambassador Caucus that help familiarize youth with the program. 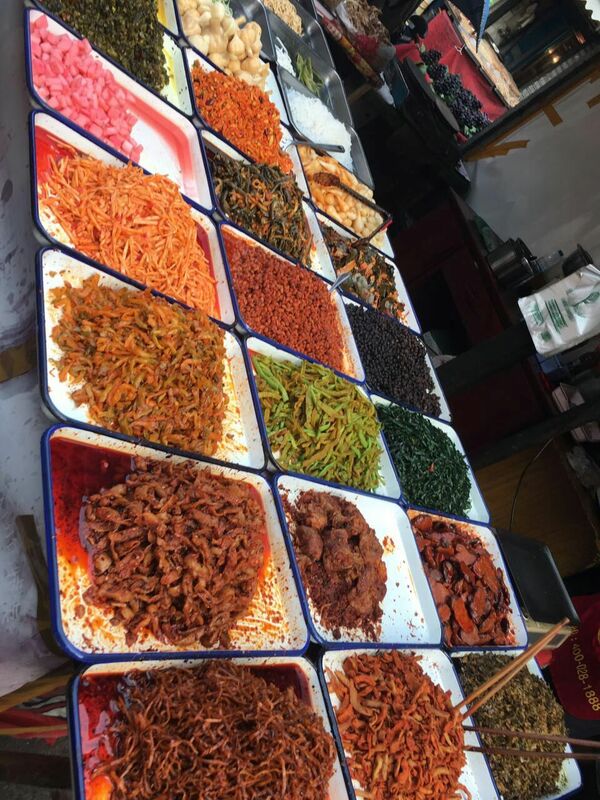 I had initially decided that I wasn’t interested in going on the food tour that was scheduled to leave at 5, but ultimately decided that it was worth the experience to try authentic Sichuan cuisine and to taste what people having been raving about. At the time that I am writing the blog, I can say with 100% certainty that I made the right decision. Since most of us left directly for the food tour from the shrine, I took a taxi to reach the starting location for our tour. After arriving to the wrong destination, I took yet another taxi ride to end up in the right location, and was greeted kindly by Jordan, a Canadian living in Chengdu, who would be our tour guide. I had previously met Jordan the night before at the reception held by the CCTICC, and I quickly found out that he was very knowledgeable about the local food and culture. We began our tour by walking through a farmer’s market filled with the delightful smells of ripe fruits and fried meat. At the end of the food market, we got the opportunity to try a local delicacy: rabbit head. I have to admit, I was initially quite queasy about the idea of eating the head of an animal that we treat as a pet in Canada, but my concerns were quashed by Jordan, who mentioned that rabbits are one of the most sustainable animals to farm for food. And so I did it; and I loved it. It was marinated in garlic and other herbs that added to the spice as well as the texture of the food. The meat was perfectly cooked and represented a delicate balance of every taste criteria: crunchiness, spiciness, roughness, and saltiness. The next stop on our food escapade was a local shop that sold beef cooked in rice. It was a nice shop, but after tasting the greatness of the rabbit head, I was only able to compare this food’s tastiness relative to that - and it paled in comparison. The last journey in what was becoming a mobile feast, was a mom-and-pop shop that sold local noodles and dim sum. I only got the opportunity to taste the noodles since I was terribly full and I am glad to say that I savored them as much as I could by that point. While writing this entry, I am frantically trying to digest the amazing food in my hotel room and am certainly ready to be impressed by Chengdu once again!